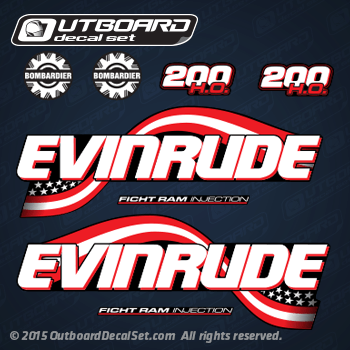 Evinrude 200 hp 200 H.O. Ficht Ram Injection Stars and Stripes decal set replica for 2003-2005 FHL and FHX Outboard Models. Replica matches OEM decals in color and shape. EVINRUDE 2003 E200FCXSTM, E200FCXSTM, E200FHLSTS, E200FHLSTS, E200FPLSTM, E200FPXSTM, E200FSLSTM, E225FCXSTM, E225FCZSTM, E225FHLSTA, E225FHLSTA, E225FPLSTM, E225FPXSTM, E225FPZSTM, E250FCXSTA, E250FCZSTA, E250FPLSTR, E250FPXSTA, E250FPZSTA. EVINRUDE 2005 E200FCXSOE, E200FHLSOR, E200FHLSOR, E200FPLSOE, E200FPXSOE, E200FSLSOE, E225FCXSOE, E225FCZSOE, E225FHLSOB, E225FHLSOB, E225FHXSOC, E225FHXSOC, E225FPLSOE, E225FPXSOE, E225FPZSOE, E250FCXSOB, E250FCZSOB, E250FPLSOM, E250FPXSOB, E250FPZSOB.